And side view. Sorry work bathroom pics.. it seems like it token pics from the lift or toilets lately... with walking shoes too! 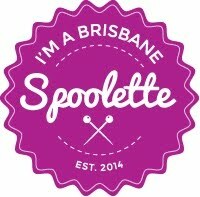 Next we move onto the annual Brisbane Spoolette's High Tea in April. As usual I was talking so much I only took a few photos. The event and group gets bigger every year. This and Frocktails are highlights of my year. It's incredible how much I enjoy meeting up with all the Spoolettes every event. We did out pattern and fabric swap. I was so good and took stuff and came home nearly empty. 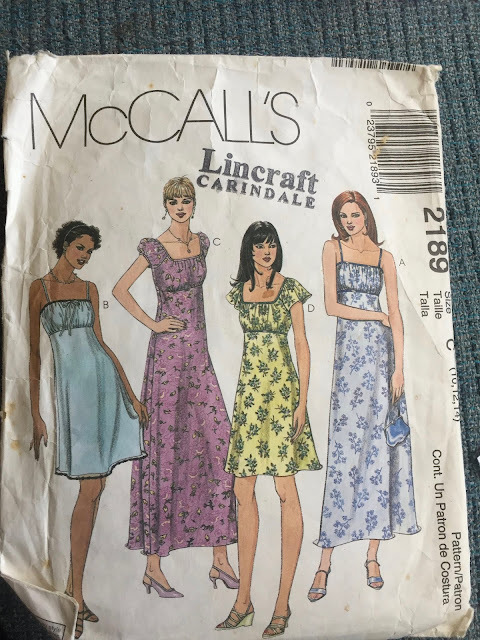 Such is my lack of need for anything more - I took no fabric but 3 patterns I think. I wore my Simplicity 8296. It is lovely rayon, read about it here. This is with my friend Sarah. The fabric of her dress was so lovely. Lately it seems like we only get this annual outing to catch up! 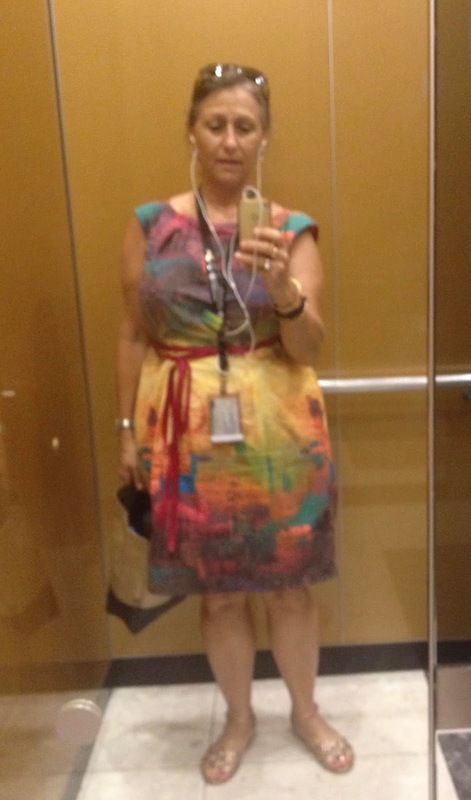 This is a Burda 7517 dress I made. I don't have a photo of the pattern envelope but it has lots of reviews on Pattern Review. It's a pretty basic dress but I did remember that the neckline was very high, which really bothers me so I lowered it by about 3 cm. I made it from a lovely cotton fabric that my son picked out in Centrepoint Fabrics in Auckland a few years ago (maybe 7). It was $3 per metre and it is the loveliest cool cotton to wear and is soft but not wrinkly. . I put some grosgrain ribbon ties but I cut them much shorter than what they are here, as the length bothered me. It looks like a vague city scape and I cut it so the big yellow block wasn't near my face as my skin tone and yellow don't go well together. I would like to finesse the fit on this because it's a quick easy make, and would make a great go to for a work dress. Maybe with a FBA for this pattern and make a smaller size overall when I have time... ha ha ha. So this dress pattern and dress below was started about 15 years ago when I bought the fabric. I had cut out view B and had made up the skirt with fabric and interlining, and the bodice lining was made and the fashion fabric ruched and tacked on. It was cut out before I had my son and I've gained weight since then but I could still get the skirt part on but I unpicked it all and let out the 1.5cm seams to about .5cm so I'd have eating and drinking room. The eating and drinking room was needed for the Spoolettes Frocktails. It was such a great event. I had to miss last years so I was so pleased to go again this year. This photo is in my bed room. I had no scraps of either the lining or the fashion fabric left or around ... it's just too long ago to remember. This meant I had to finish the top somehow and make straps. I used a very average quality satin bias binding that I had and finished the hem with a rolled hem on my overlocker in red. The fabric is a mesh with the flowers like decoupage on it. I just love, love, love the fabric and although it's not perfect, made and worn is better that in a plastic bag tucked away. This photo of of me and Alice in her AMAZING Nicola Finetti Vogue 1471 - photo screenshot from someone's instagram - as usual did not take enough photos. I was trying for weeks to choose a pattern and fabric from my embarrassing stash but nothing really grabbed me for some reason so also as usual, I found this in the old UFO box and though why not. I had the Friday off so finished it up then. I just really love that fabric so I'm glad I've got it to wear this summer. I'm also wearing my Burda coat I made in 2010 and still love. As luck (really not planned) would have it, I had a hairdresser appointment that day so my hair even looked ok! There were so many really beautiful dresses there this year and many new people. Such a joy to connect with others who sew. Amy and Colette did a great job organising and the venue was terrific. Plus excellent food (really I'm fussy and it was really good) and the drinks were of good quality - none of that cheap stuff! Well done (again) ladies! I've also delved into bras again. So far I've made the Shelly from the course I did.. I wasn't very pleased with the course but live and learn I guess. This is the Kwik Sew 3300 partial band bra. I prefer a partial band as I'm so short waisted I find these more comfortable. It's the size 10 DD. That's the largest size and it's a bit small. I made this out of scraps and harvested straps to test the fit and size and I can wear it all day and it's comfy to a point. I think the bad channelling and harvested wires are not good quality and so dig in, but it's a good start. I've got another Kwik Sew partial band pattern I'll try too. I used the band from the bra I made in the course made it about 3 sizes smaller and tried cups from Porcelyne patterns... both these did not fit although I measured twice and they are both too small and both a bit pointy. They had a sale and I think I got two bra patterns for US$6 pdf. The 4 piece red cup is one I bought and the other one is one of the free patterns she has. I also bought the Christine sports bra but I haven't tried it yet. Sorry they aren't good photos but they were a quick way to check for fit. I'll persist here. I am determined to make a bra that fits eventually. 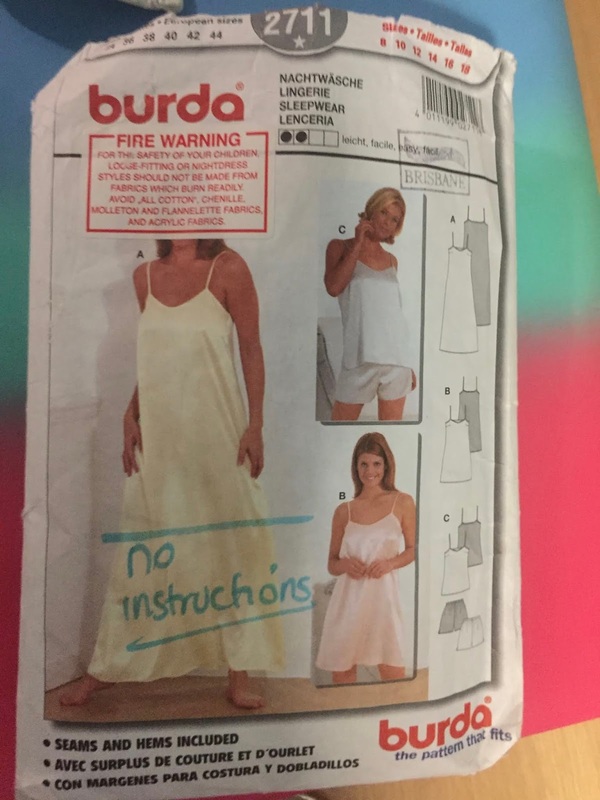 Lastly I have made some new pyjamas from my trusty Burda 2711. This is a great pattern that I'm going to make in a linen for summer. I move the darts to fit better.. a bit lower and shorter and I extended the back crotch curve about 2 cm. I used a cotton bought from Spotlight that I made a dress out of probably 6 years ago. I really liked that dress but not sure why I got rid of it?? These were made of the scraps. The top is cut on the cross to use up all the fabric and it was the only way to make it fit. I made self bias binding and actually measured the length of the straps so they don't fall off. The last ones I made I didn't think about it at all and use the length offered in the pattern. I am really short from shoulder to underarm and when I look I think they are too short but they fit perfectly. I'm really pleased to use this fabric and to have new pj's. The last ones were wearing through. I'm working on some more UFO's and finished up some Burda "Hudson" pants in French terry from the fabric sale I go to. More on that later. Welcome back! You have made so many amazing things! 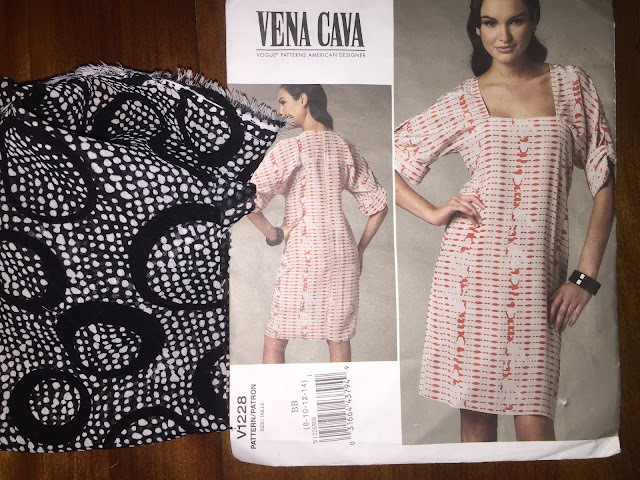 I love your Vena Cava dress, it looks so good on you! I really like it all, and the bra is beautifully constructed. I especially love that off shoulder Simplicity! Good for you! Awesome progress. And how challenging is that bra?! I want to try that too.